The animals were discovered near a dried up water hole. Ninety wild horses have been found dead in the Australian Outback in the latest sign the nation is struggling to cope with this week’s record breaking heat wave. A team of Aboriginal Rangers made the discovery at Santa Teresa, Central Australia, near a dried up waterhole, the local authority Central Land Council said in a statement. 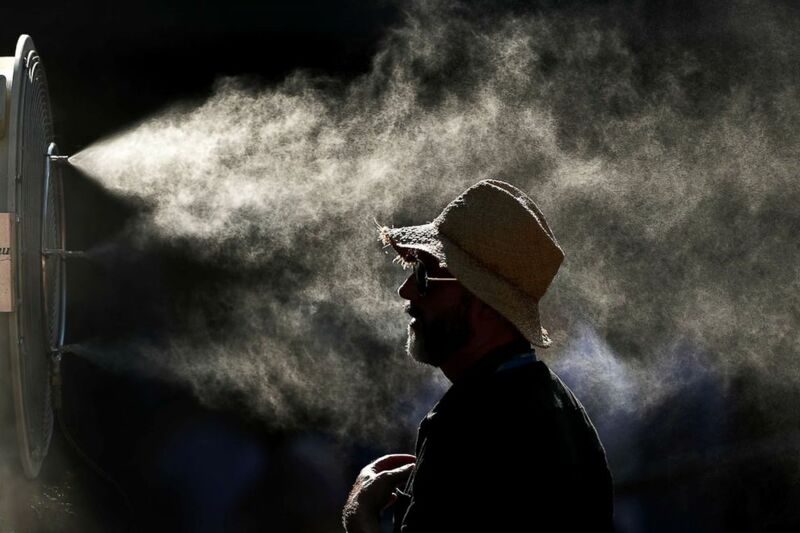 (Matt King/Getty Images) Fans cool off in the hot conditions at the 2019 Australian Open on Jan. 24, 2019, in Melbourne. The authorities also announced they had made the decision to cull a further 50 horses in the area after the discovery of the carcasses, as carcasses can poison other watering holes local wildlife depends on. Horses and a number of other wild animals are dying of thirst in the Outback as reliable water sources dried up during the sweltering heatwave. "With climate change well and truly upon us, we expect these emergencies to occur with increasing frequency and nobody is truly prepared and resourced to respond to them," said CLC director David Ross in the statement. 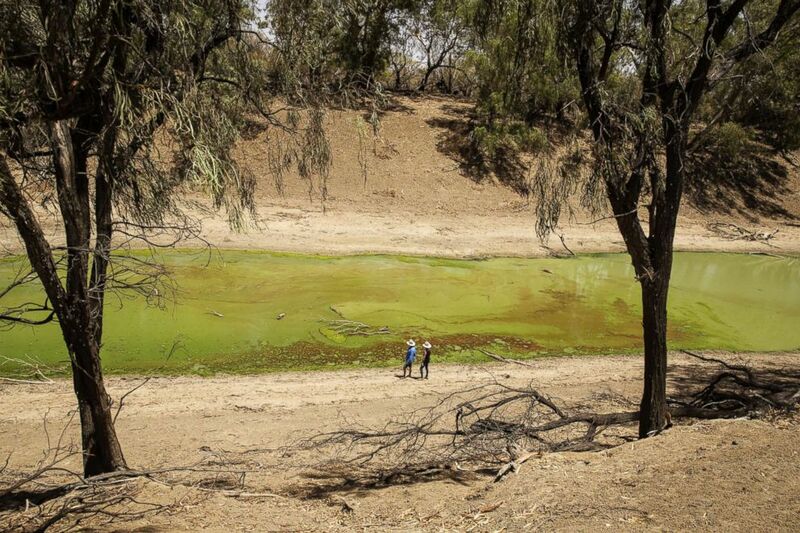 (Jenny Evans/Getty Images) People stand on the banks of the Darling River, which is currently affected by extreme heat, drought and dust in Tilpa, Australia, Jan. 16, 2019. Authorities are hosting a community meeting on Thursday as some local residents are opposed to the culls. A series of shocking photographs taken by Australian man Ralph Turner of the scene were shared on social media and by the local press. "We found all these poor horses, all perished," Turner told ABC News Australia. "We've been having hot weather, day after day. I just couldn't believe something like that happened out here, first time it happened like that." 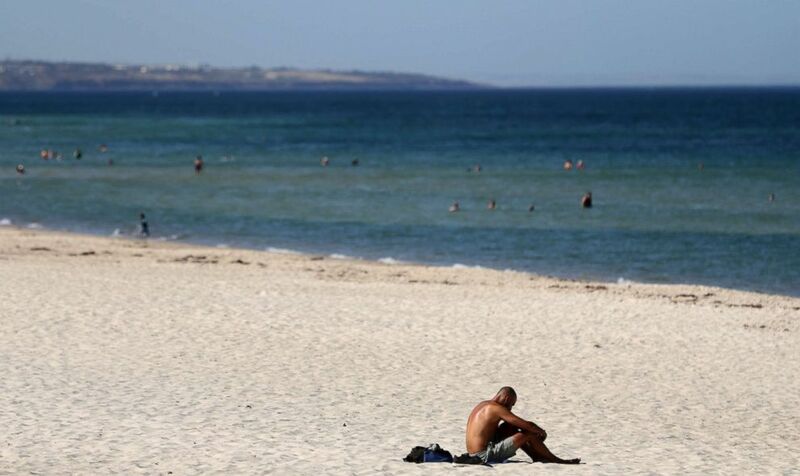 (Kelly Barnes/AAP Image via AP) A beachgoer sits in the sun on Glenelg Beach in Adelaide, Australia, Jan. 24, 2019. Central Australia, known as the "Red Centre" because of its red desert and searing temperatures, has experienced record high temperatures along with the rest of the country in recent days. The region where the horses were discovered had just experienced a record 12-day run of temperatures above 107 degrees Fahrenheit, according to ABC. In a recent update, the Australian Bureau of Meteorology said that although the heat wave was shifting, there are no signs yet that the nation will cool down soon. "As was expected, the extreme heat has shifted towards the southeast," they tweeted. "The current temperatures again show the vast extent of this heat extending across the country, with large areas above 40 degrees [104 Fahrenheit]. Take care heading home tonight."